Gardeners and allotment growers have the greatest choice in the application of Mother Earth's Minerals to their plots. If you are new to an allotment site or have empty beds in your garden, weeding, than an application of the volcanic basalt before planting is ideal. Leave the weeds and they will grow even bigger in basalt! If you have an existing plot, application of basalt around growing plants is also beneficial - it need not be dug in - for non-digging methods have been used when growing with our organically sourced volcanic basalt in Mother Earth's Garden in Devon. In open ground and were re-seeding occurs - in meadow, pasture or in field crops of grain, rapeseed, etc. the application of Mother Earth's Minerals can be done with a spreader, preferable before seeding begins. Allowing the ground to stand for a time exposed to the rain is a great start; water will carry the smallest particles of basalt deeper into the soil for immediate access by micro-organisms, while the larger particles remain on the surface for a more gradual breakdown from the elements. Crop rotation works in pastures too. Moving animals from one open pasture or even a small holding area routinely allows for seeding and regrowth. 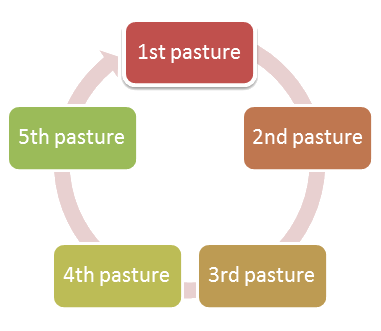 Whether there are five acres, fifty acres or five hundred acres rotation of us is sustainable - for the pasture as well as the animals grazed there. With Mother Earth's Minerals, the volcanic basalt dust can be added during the reseeding process. Livestock will be moved from the pasture they have most recently occupied, to the one that was seeded and re-mineralized first; just as you would have originally done with basic crop/field rotation Based on the allotted time animals are normally held on one plot, re-seed and mineralize the second, third, fourth and fifth pastures to allow them to be used as they were before these improvements were made. PLEASE CONSIDER: As re-application of volcanic basalt need only be done every fourth year, little disruption to the existing use of pasture lands or any additional disturbance of animals is required.